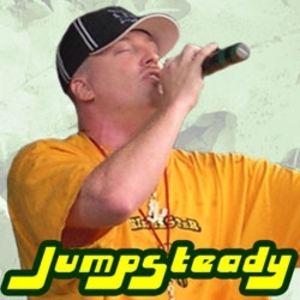 Jumpsteady (aka Robert Bruce) is a Psychopathic Records artist and older brother of Joseph Bruce, "Violent J" of the Insane Clown Posse. Jumpsteady is a veteran of the U.S. Army and fought in the Gulf War as part of the 1st Corps Support Command, better known as COSCOM. He created the game "Morton's List." Jumpsteady also created a board game called "The Quest for Shangri-La", released in Fall of 2006. He has been featured on many Psychopathic Records releases (both directly and indirectly) ever since his debut on the Insane Clown Posse's album Carnival of Carnage (1992). He announced his debut solo EP Chaos Theory in 1997 but it was not finished and released until 2002. In 2004 he announced his intentions of returning for a full length solo LP, called Master of the Flying Guillotine, released in 2005. Jumpsteady has always been the driving force behind the operations of the Gathering Of The Juggalos.